On March 24, 2014, Olive was on her way to the subway. 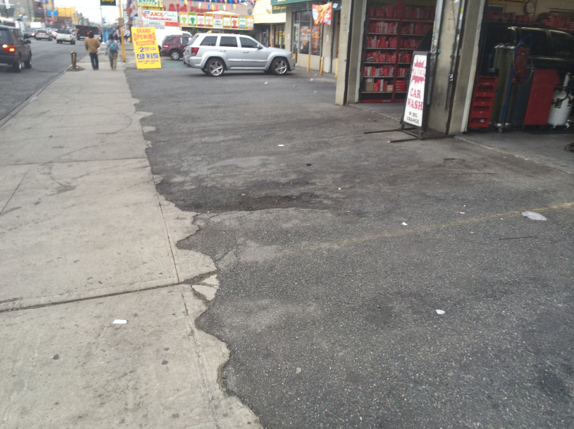 As she was walking by 482 Utica Avenue in Brooklyn, New York, she tripped over a pothole and fell down face first. As a result of direct facial trauma from the fall, Olive hit her mouth on the ground, breaking her front teeth. She also injured the right side of her rib cage. Olive went to Kingsbrook Jewish Hospital the day of the accident and received treatment for her orofacial injury as well as CT scans of her head and right side before being kept overnight. As a result of the post-accident pain and discomfort following her injury, Olive had teeth # 7-11 extracted at Bellevue Hospital Center’s Oral and Maxillofacial Surgery Department. She also had a temporary upper partial denture constructed to replace the extracted teeth and a fixed temporary bridge inserted (teeth # 2-4). Olive lost a lot of weight because she could not eat properly. “Eating was very difficult. I had to cut up everything like a baby,” said Olive. She also had difficulty breathing due to a fractured rib on her right side. Olive was in bad shape! If it weren’t for the defective sidewalk, she wouldn’t be going through any of this. She knew she was going to need legal help. A friend referred Olive to The Case Handler team. At first, she didn’t know what lawyer to hire. Once she spoke to The Case Handler team…she knew exactly who to pick! The Defendant argued that the pothole was a recent development they had no prior knowledge of and that it was also “open and obvious” for attentive pedestrians to avoid. 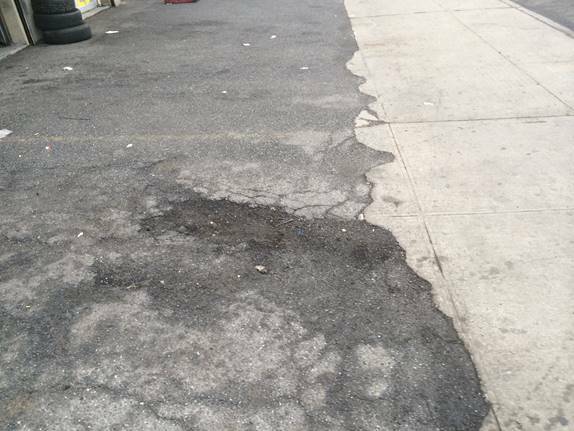 With the help of The Case Handler team, we proved that the pothole was visible for years through good ol’ Google Maps (so not a recent defect), and that there were no signs or markings on the defective sidewalk to clearly make the pothole “open and obvious” to pedestrians. While at Walt Disney World® with his family, Adam Handler – The Case Handler successfully settled Olive’s case over the phone for $150,000.00! Sorry kids, daddy is always on the job. 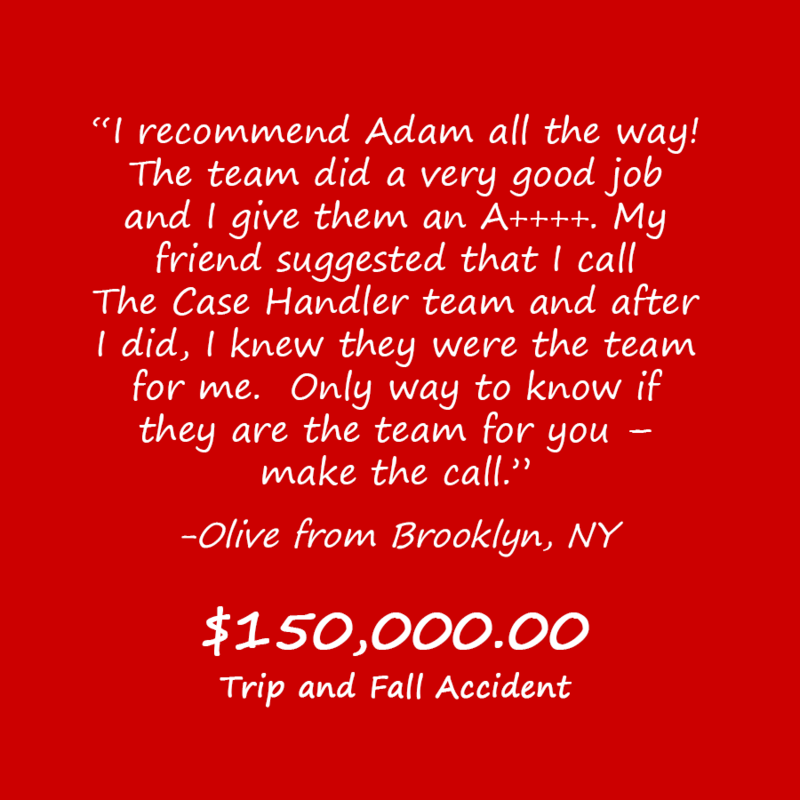 Not only will the Defendant’s insurance company fight tooth and nail to pay as little as possible for your injuries, but they may even resort to lying to diminish your bodily injury claim (just like Olive went through). If you’re injured and the Defendant is making false claims, it is vital to seek legal counsel from a respected and experienced New York personal injury attorney that knows how to combat their tactics. While you focus on healing, The Case Handler team will have your back till settlement day and beyond. Whether you’re not sure if you have a case or which lawyer to hire like Olive went through, “make the call” to find out.